Bumble & bumble have added a little gem to their sumo range – semisumo. 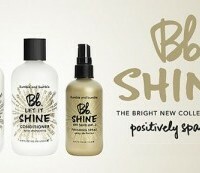 It claims to be ‘strong on shine and soft on hold’ and that’s no lie. Not as heavy as a wax but thicker than a serum or oil, it’s the perfect antidote to frizzy or flyaway hair. And being Bumble & bumble it has a lush scent too. Whatever your hair type, run a pea-sized amount through dry hair to tame, define and add texture and shine without weighing it down. For medium to long hair use it after blow-drying to calm and tame frizz, and on short hair use it for detailing. It’s also great for smoothing into an up-do for a high shine finish (check out the photos on our Facebook page). Since the Bumble Artistic Team came to Kaizo to demo the new product we’ve loved playing with it. It’s on the Kaizo shelves so ask our stylists to show you how to apply it and what shapes you can create with it. For £21.50 you can take a pot away with you and wave goodbye to annoying flyaway strands!